The markhor is a member of the goat family which may weigh up to 110 kg (240 lb). It has unusual spiraling horns which may be straight or flare outward, depending on the subspecies. 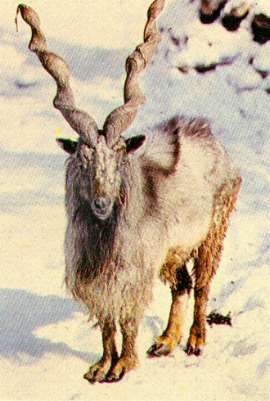 The markhor occupies arid cliffside habitats in sparsely wooded mountainous regions at altitudes ranging from 700 m (2300') from November to May up to 4000 m (13,000') in the summer. In the spring and summer, the markhor mainly grazes on tussocks of grass. When these have dried up it browses on leaves and twigs. The markhor forages 8 - 12 hours daily, and it is usually active all day except for several hours in the middle of the day, when it rests and chews its cud. Years ago, herds of markhor with 100 or more animals were common. By the 1970's the average herd size was 9, with some as large as 35 (Schaller 1979) . The reasons for the markhor's decline include intensive hunting (for trophies, meat and the Asian medicine market), disturbance and loss of habitat due to expanded human settlement, and competition from domestic livestock. *** The markhor is one of the most desired of all hunting trophies, with the record horn length exceeding 1.5 m (60"). *** Goats such as the markhor are found in the same general areas as various species of sheep. In order to coexist, goats and sheep divide up their habitat so that the goats occupy cliffs and their immediate vicinity, while sheep prefer the plateaus above cliffs and the gently sloping areas below them. Females weigh 30 - 40 kg (70 - 90 lb). Males weigh 80 - 110 kg (180 - 240 lb). The markhor occupies arid cliffside habitats in sparsely wooded mountainous regions at altitudes ranging from 700 m (2300') from November to May up to 4000 m (13,000') in the summer. It avoids deep snow. Mating occurs during winter; births occur from late April to early June. 1 or 2, rarely 3. A young markhor is weaned at 5 - 6 months. The markhor is a grazer and a browser. In the spring and summer it mainly grazes on tussocks of grass. When these have dried up it browses on leaves and twigs, including the leaves of trees such as Pistacia and evergreen oak. When acorns are plentiful It especially enjoys mast. The markhor forages 8 - 12 hours daily, and it is usually active all day except for several hours in the middle of the day, when it rests and chews its cud. Years ago herds of markhor with 100 or more animals, usually consisting of females and young, were common. By the 1970's the average herd size was 9, with some as large as 35 (Schaller 1979) . Although some adult males remain with the females throughout the year, most males only join the females during the rut. In one study, an average of 1.3 young accompanied each adult female in November, when about 6 months old. A year later only about 0.5 per adult female remained, a reduction of nearly 60% (Schaller 1979) .